Q: How does SURGIBIN® help control infection? A: Simply by preventing accumulation of microbe-harbouring dust. Q: How does SURGIBIN® fight dust? 1. The metal construction of SURGIBIN® dissipates static electricity that attracts dust. On the other hand, old style plastic bins hold the charge and attract dust. 2. The smooth chrome finish of SURGIBIN® help prevent dust particles gaining a “mechanical” foothold on the bin. 3. Larger diameter wire and open construction prevents the entrapment of particles common in closely positioned structures or gauze. The 5 SURGIBIN® sizes closely match old plastic bin sizes. When you update, stock stays in the same sized bin in the same spot i.e. no search for new locations, no confusion. 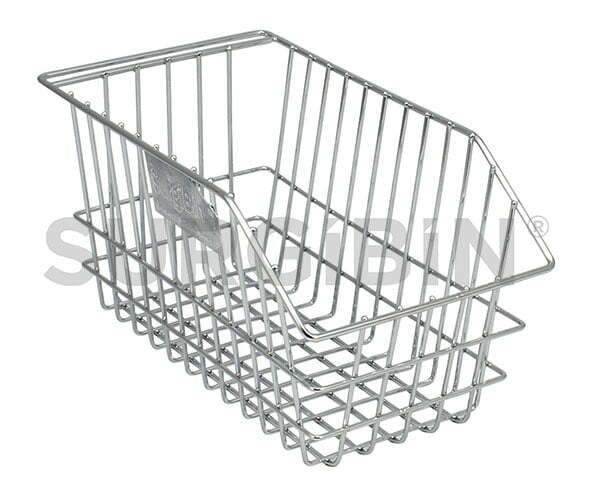 SURGIBINS® stack or hang like plastic bins. SURGIBINS® have an easy to clean silver chrome wire finish. SURGIBIN® provides the highest standards for your medical storage needs. SURGIBIN® chrome wire storage products are designed specifically for the medical and healthcare sectors. Durable and reliable, SURGIBIN® products reduce contaminants, keep sterilised stock protected, and decrease potential hazards – all while maximising the use of storage space in your hospital or medical facility. SURGIBIN® chrome wire products hold an extensive range of medical supplies for organised infection control storage. It’s all about superior quality to ensure durability and longevity so that your hospital or medical facility continues to operate smoothly.